Hi guys! Sorry for the lack of Nibs & Nails this week, but it's just been a really hectic getting all of these giveaways together. All previous winners have been contacted, so if you haven't heard from me, you haven't won (yet). There are plenty more giveaways to come, so you still have a chance to be a winner (I mean, we're all winners here anyway, right?). In other blog news, I should probably let you guys know that I will be on vacation next week. Don't miss me too much! I try not to take many blog breaks, but it happens from time-to-time. 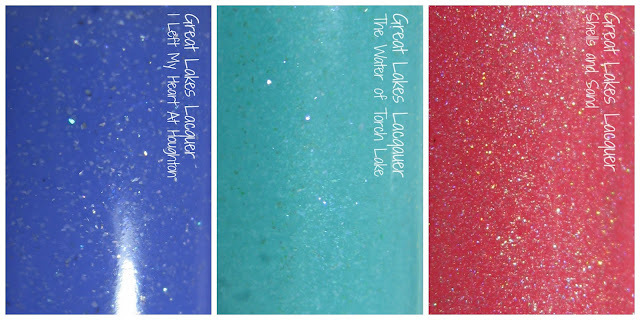 Great Lakes Lacquer will be releasing 3 limited edition polishes on August, 1st at 3:00 PM EST in their Etsy shop. While you're there, pick up my duo of Nibs & Nails polishes inspired by Diamine fountain pen inks for $15 (you save $1 that way). Shall we get started? Hi guys! Don't forget to enter the latest Nibs & Nails giveaway from Contrary Polish that started on Friday. Tonight I have a polish from a brand you may have seen at your local Walmart, Rite Aid, or Five Below store. Personally, I've only seen the Nail Medic system at the Walmart near me. 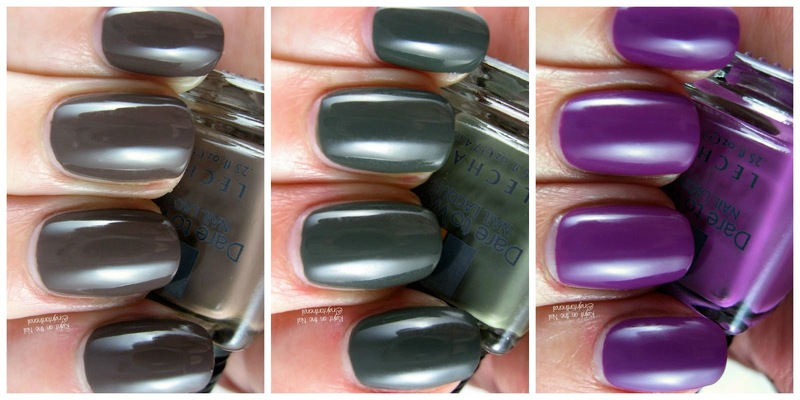 Maybe your neck of the woods has Pretty Woman NYC nail polishes, but I've never seen them. No worries, you can get any of their items on their website with free shipping on all orders. 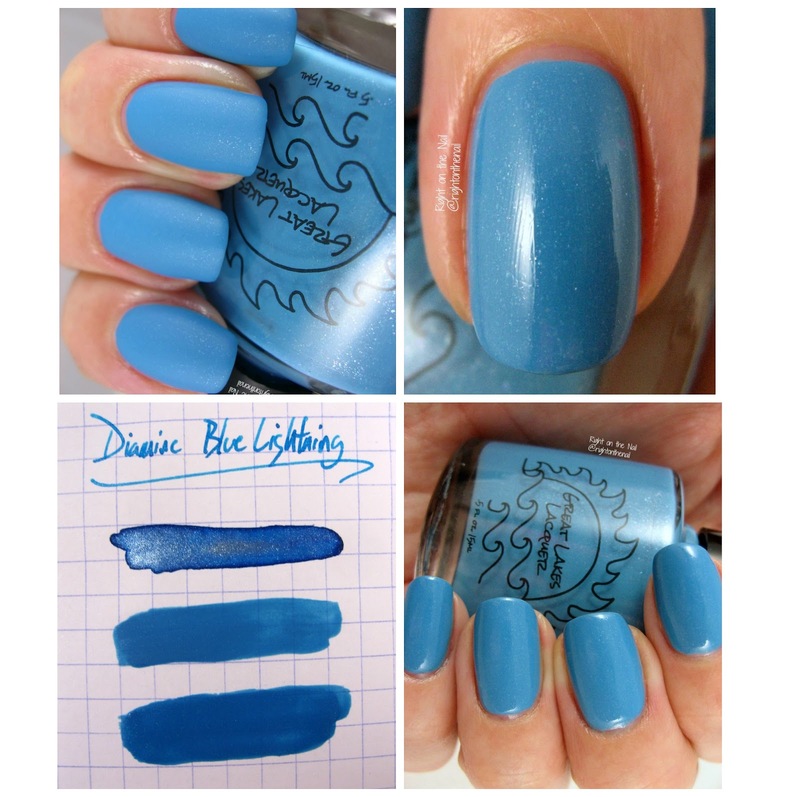 Turks & Caicos comes from the Sand Collection which is pretty much like the Zoya PixieDusts. 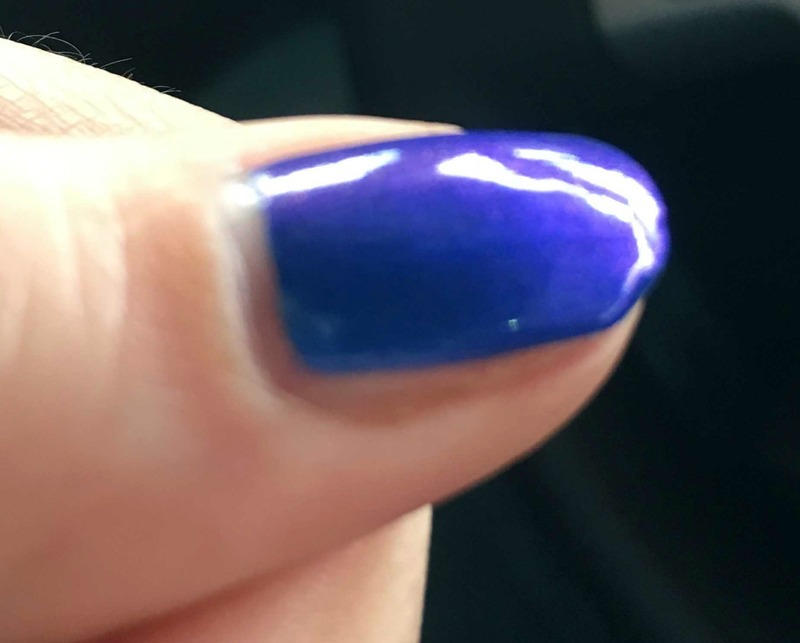 Did I realize this before I applied the polish? Nope! I used one thin coat of topcoat for the photos above, but you can see that it just ate it up completely. Anyway, Turks & Caicos is a turquoise blue polish with loads of silver and blue glitter. 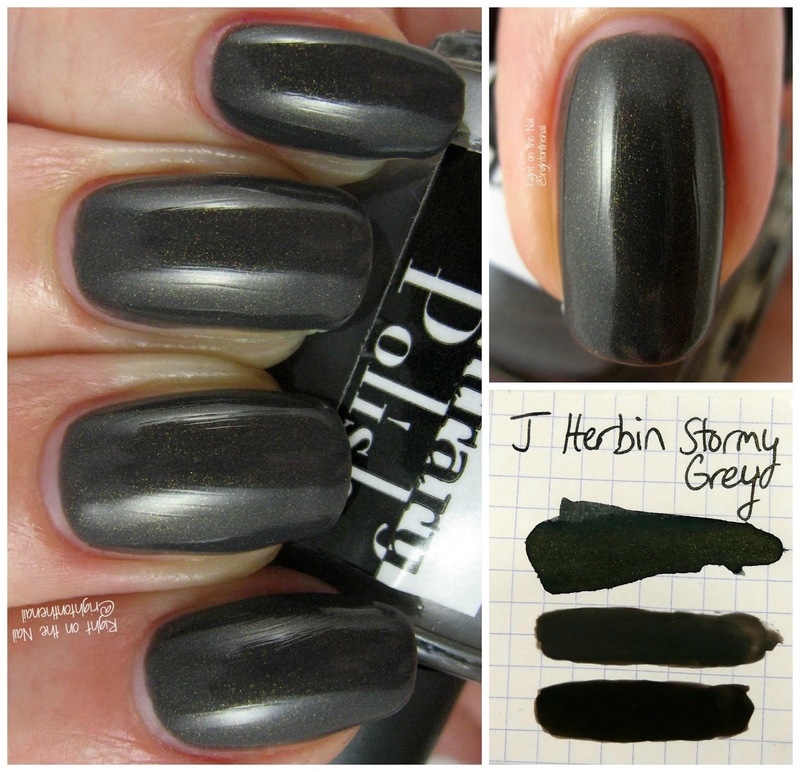 This polish is extremely opaque, and you will definitely not need more than 2 coats to cover the nail line. It dried really quickly even with my addition of unnecessary topcoat. I'm surprised to say this, but I think I like these as much the PixieDusts. Good job, Pretty Woman! You can get all of their polishes on their website, and most of the colors retail for $7.99. Learn more about Pretty Woman NYC on their Facebook, Instagram, or Twitter pages. Hi guys! Don't forget that the next installment of Nibs & Nails will be this Friday. The giveaway for the 2 custom Great Lakes Lacquer polishes will also end (followed by the release of the polishes in her shop on the 22nd). Tonight I have 2 polishes from Polish 'M's Rest & Relaxation collection which will be restocked this Friday at 11 AM PST on her website. Michelle is also celebrating her 4th year in business, so congratulations to her! This celebration happens to come with a special pre-order for a polish called 'The 4th Year' which goes from July 22-29. Oh, and the summer cuticle oil scents will be on sale for $5. Ok, enough with the information overload; let's get on with some pictures! Hi guys! I hope your week is off to a great start! Don't forget that I have another giveaway going until this Friday (when the Nibs & Nails polishes will also be released in the Great Lakes Lacquer store). I bought several polishes from Michelle at Polish 'M with the 30% off code Right30. Feel free to use the code as much as you want (minus Polish for Pit Bulls). The two spring prototypes I have to show tonight are still on sale for $3 each ($2.10 with the discount code) so you may want to buy them soon if you are remotely interested in them. Let's take a look! Nibs & Nails Presents Heather's Hues A Most Majestic Blue (Inspired by Diamine Majestic Blue) Swatches + Giveaway! Welcome back to week 2 of Nibs & Nails! I basically provide an indie maker with a particular fountain pen ink for them to dupe (or just be inspired by). 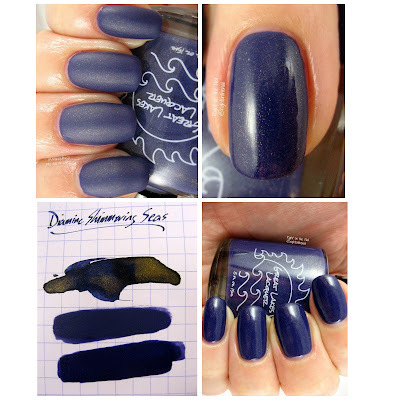 This week we welcome Heather's Hues to dupe a popular ink from the brand Diamine. Unlike many of the other inks I'll be showing in the coming weeks, I asked Heather to do one that does not have shimmer in it. Instead, when you put a lot of Majestic Blue on some good paper, you'll notice that there is almost a redish sheen to it. Duochrome anyone? It just so happens that tonight Heather is also releasing a collection called Day and Night tonight, so make sure to check out the site later tonight. 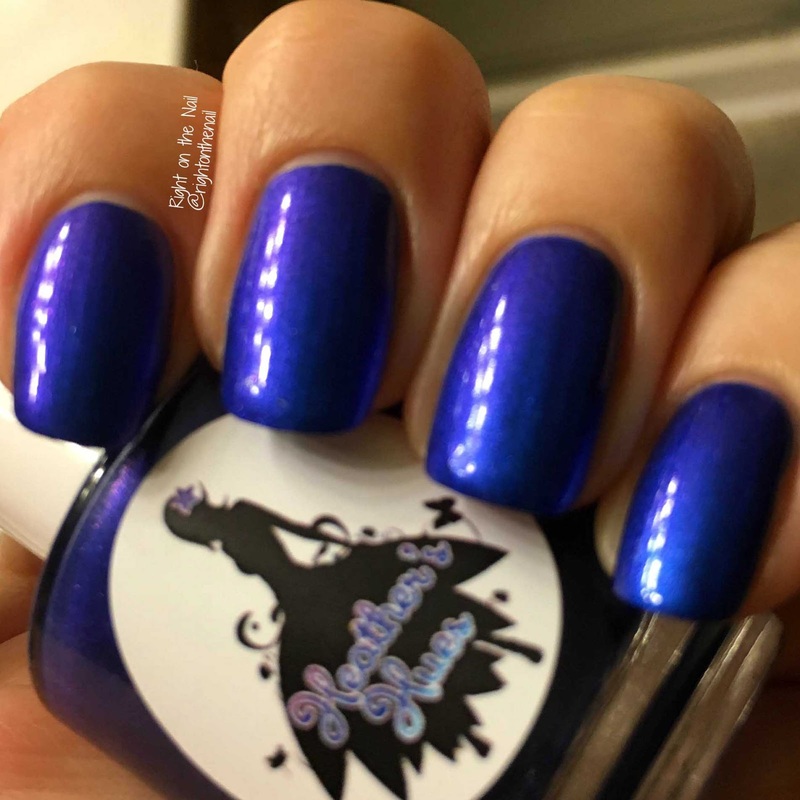 She was also kind enough to provide a second bottle of A Most Majestic Blue for you guys, so check out the Rafflecopter widget below to enter now! Also, make sure to check out what Inkdependence has to say about the ink before or after you read here. It's really hard to tell in these photos, but Heather did a better job at duping this than it immediately appears. 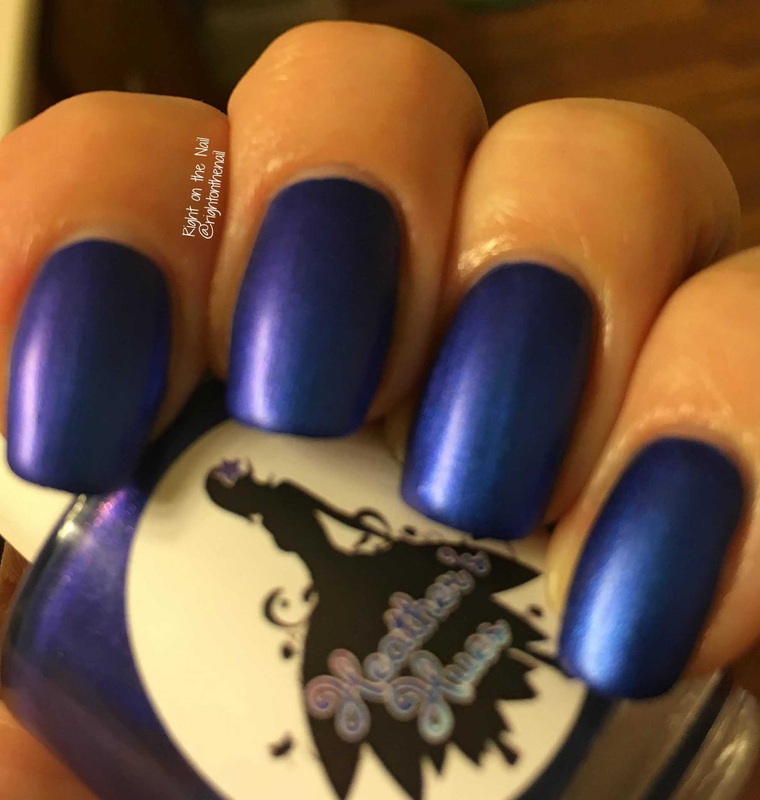 It looks like A Most Majestic Blue is a lot brighter than the ink, but if you look at where just a little bit of ink was laid down, the color is really similar to the polish. If you have a finer nib and less ink going on the paper, the swatches would look much more similar. Also, the red/pink duochrome sheen seen on the nail and bottle are pretty much nonexistent in the bright light here. Let's see if I can get a better picture of the duochrome. Nope, so far I haven't done a better job at showing the duochrome. 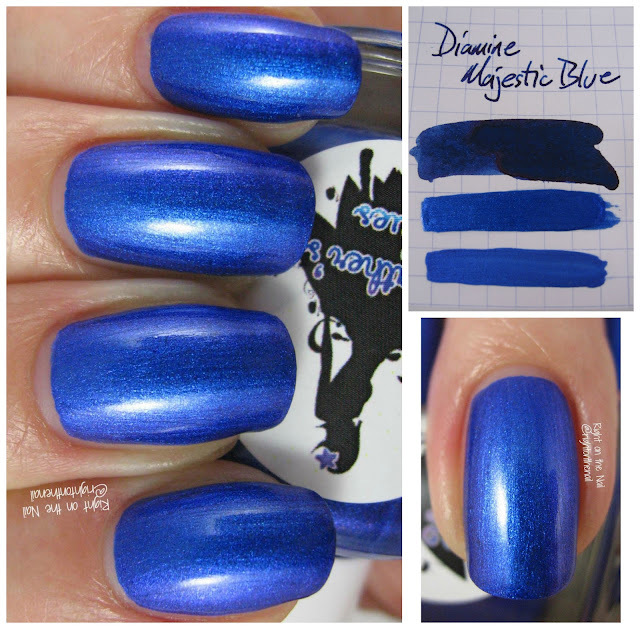 The polish is a bright blue shimmer with a subtle red/pink flash. It dries down to a satin finish without topcoat, and it actually looks really similar to what the ink dries to on paper (+1 for Heather!). As you can see, bright LED light is not the best to capture this warlock. The next pictures were taken in both of my bathrooms. Yeah, they are blurry, but that's not the point. DO YOU SEE IT?! Man, not being able to capture the duochrome was killing me! And my finger hair is just gross, sorry. There you have it! I hope you're enjoying this segment as much as I am. 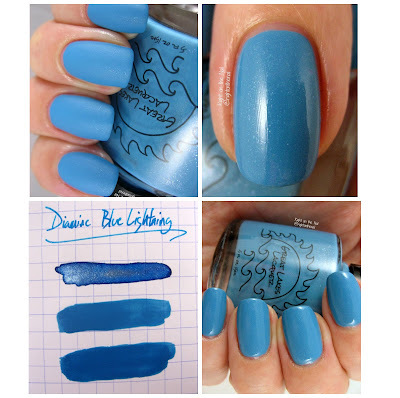 To win this polish, enter below. As far as I know, this will not be released in her store at this point, so you have the chance to win a pretty rare color. Polish 'M Nail Polish Swatches and Review: Stained Glass Window II + 30% Off Discount Code For You Guys! Hi guys! I'm sure several of you feel the same way when I say that today does not feel like Wednesday! Unfortunately I have another polish to show you today that is discontinued, but don't worry because there is a bright side. Michelle from Polish 'M provdided me with a discount code for 30% off all items except for the Polish for Pit Bull colors. All you need to do is enter the code Right30 to get the discount. Did I mention she has her spring crellies on sale for only $3 for full-sized bottles? And that's not after using the discount, either! A few colors are currently out-of-stock, but I believe Michelle will be restocking some of them if a favorite is sold out. Tonight I have Stained Glass II which is a densely packed holographic silver microglitter with multicolored circle, hexagonal, and square glitter. I used 2 coats over a simple grey basecoat because macro photos tend to show ever little bald spot, but I'm sure you'd be able to get away with using it on its own. I actually really like it either way. And how can you resist circle and square glitter? For the largest circular glitter pieces, you will need to do a little bit of fishing, but the rest of the glitter comes out easily in regular brush strokes. The silver microglitter isn't really gritty, but you may need to double-up on topcoat due to the amount of glitter in here. Like I said, you can't find Stained Glass II for sale anymore, but she has some other gorgeous polishes that you can use that 30% discount code on. You can find Polish 'M on their storefront, Facebook, Instagram, and Facebook Group (which I am a part of!) pages.